Column5 is the world’s leading-edge consulting firm dedicated to providing high-value services that help customers leverage the power of SAP's Enterprise Performance Management (EPM) suite. Column5 was founded in 2005 by key players from OutlookSoft, and quickly evolved into a global team of experts who are uniquely qualified to properly design and deliver comprehensive systems, addressing a wide range of industry and process-specific requirements. 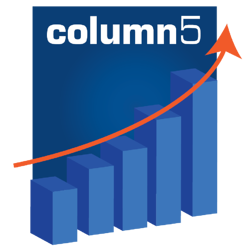 Column5's custom tailored solutions combine proven software with unparalleled technical skills and visionary enterprise performance management process expertise to deliver prompt return on investment, long-term independence and a competitive edge for our elite list of discerning clients. Column5's mission is to deliver exceptional organizational effectiveness in partnership with our clients. While change can be challenging, our job is to facilitate the journey from where you are today to where you want to be tomorrow. Our time-tested strategies avoid common pitfalls, and reflect your organization's culture, management style, and appetite for change. It's a pragmatic, solutions-based approach, based on a foundation of the world’s most comprehensive and leading-edge Enterprise Performance Management (EPM) content and educational tools. The overall impact is not only continuous improvement in the effectiveness of individual processes, but in their connections to each other. Column5's culture fosters an approachable, friendly style, with consultants who freely share their expertise in business-process design and execution. Our focus on knowledge transfer is geared toward making your enterprise self-sufficient—ensuring that you can independently own and develop your own processes and applications going forward, with Column5 in the background, ready to offer support as needed. We employ exceptionally talented people who not only have a unique combination of skills and experience, but are also results-oriented, responsive communicators. Of course, you are the ultimate judge of how satisfied you are with our service levels. With that in mind, we actively solicit and incorporate your feedback—with an eye on developing a solid, long-term relationship as well as improving empirical measurements of value. Column5 was founded in 2005 by key members of the team that made OutlookSoft an international success, with the goal of creating a consulting partner that could bridge the gap between software providers and pure implementation contractors. We are proud of our position as an influential SAP partner, dedicated exclusively to EPM. Much of the knowledge base and expertise about SAP EPM resides within the Column5 team, and we ensure our clients have full access to every aspect. Column5 is large enough for clients to benefit from our investments in technological infrastructure and best-of-breed services, while remaining flexible, agile and personally invested in our clients' success at the highest levels of our organization.